Arctic Treasure Video Slot Guide & Review - Casino Answers! Arctic Treasure is 5-reel, 20-line video slot developed by Playtech, featuring a wild symbol, scatter wins, multipliers, a free spins feature, gamble feature and a bonus game. You can play the Arctic Treasure video slot at Bovada. Coin values on the Arctic Treasure slot machine are $0.01, $0.05, $0.10, $0.25, $0.50, $1, $2 and $5. You can select 1-20 paylines per spin on the Arctic Treasure slot game and 1-10 coins per line. You can bet as little as a penny on the Arctic Treasure penny slot up to the maximum total bet of $1000. Arctic Treasure has an incredibly vast betting range that will suit any online casino player, regardless of betting habits. You may play up to 99 autoplay spins on the Arctic Treasure online slot. To play the Arctic Treasure video slot, select your bet and press the “Spin” button. Alternatively, you can press the “Bet Max” button to play all 20 lines at 10 coins per line. 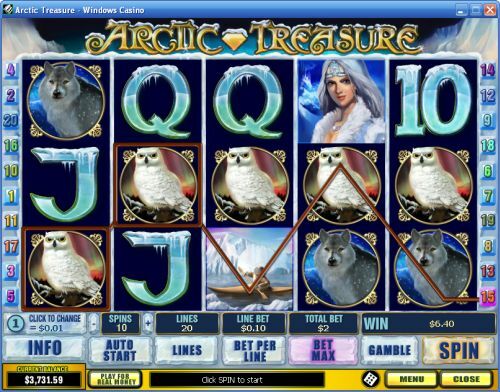 The highest paying symbol on the Arctic Treasure online slot is the Ice Princess symbol. 5 Ice Princess symbols on a selected payline will pay out the 10,000 coin top jackpot. The Ice Princess symbol is a wild symbol and will substitute for all symbols except for the scatter and bonus symbols. The scatter symbol on Arctic Treasure is the Eskimo Kayaking symbol. 2, 3, 4 or 5 scatter symbols will pay out 2X, 5X, 25X or 100X your total bet. 3 or more scatter symbols will win you 10 free spins with a 3X multiplier. You can win an infinite number of free spins by re-triggering the free spins feature. Win your arctic treasure by hitting this feature on the Arctic Treasure video slot at Bovada! After any win you get in the Arctic Treasure slot game, you can press the “Gamble” button to open up its gamble feature. In the gamble feature, you will be able to double your winnings or double half your winnings. Choose a higher card than the dealer’s card on the left to win. Press the “Collect” button to collect your winnings and exit the gamble feature. You may win up to the double up limit listed in the “Info” section. Only the highest win pays per payline. Winning combinations pay from left to right only, except for the scatter symbol (which pays any). Payline wins are multiplied by the bet per line. As you can expect, Playtech seldom skims on presentation. Arctic Treasure looks simply amazing with some great animations to enhance the experience even more. The Arctic Treasure video slot backs up the presentation with a great top payout, bonus game, free spins feature and gamble feature. You can play Arctic Treasure when you sign up and make a deposit at Bovada! Can players from the USA play the Arctic Treasure slot game for real money? Unfortunately, players based in the United States cannot play the Arctic Treasure slot machine for real money at this time. We recommend visiting Bovada for a USA-friendly alternative. How do I get to the Arctic Treasure bonus feature? To make it to the Arctic Treasure bonus game, the Crystal bonus symbol must land on reels 1 and 5 at the same time.